OK, so I mentioned that the '71-'73s aren't quite as big as everybody thinks. The specs say enough: a few inches longer, one inch longer wheelbase, a few inches wider, but fail to note that the roof is about 1 1/2" shorter than the previous year's Sportsroof/Mach 1s. The biggest issue of why the '71-'73s seem so 'gigantic' compared to the '69-'70s, is because of the squared off nose of the former vs. the tapered nose treatments found on the latter. So, let's check out some pics. 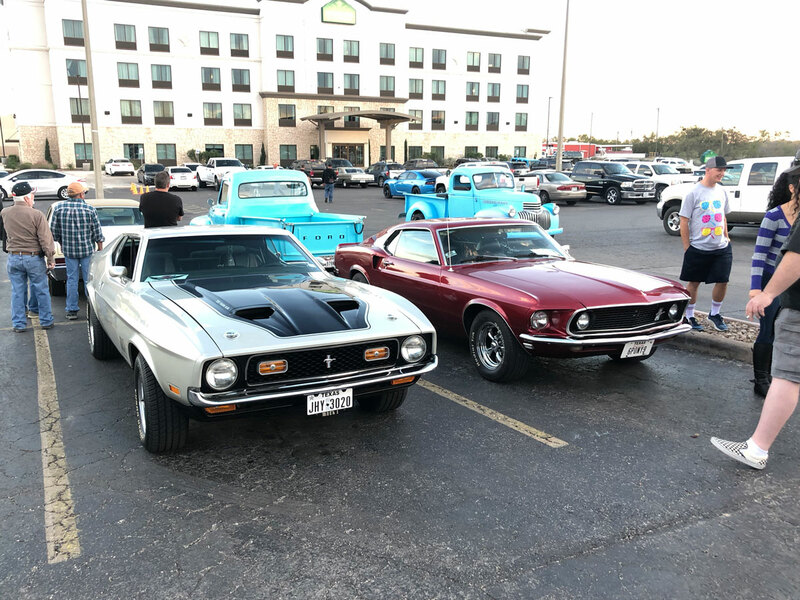 This one was taken last weekend (17 Nov, 2018) at a local car show with my '71 parked next to a buddy's '69 Sportsroof. The '71 looks gigantic in comparison. because of the optical illusion of perspective. Let's switch angles a bit and see what we can see. To me, it's still apparent that the '71 has a longer nose, however, the '69 suddenly looks a lot bigger than it seemed in the other shot. That's because of perspective. But here we have a '71 and a '70 parked nose to nose with the '70 a little bit closer to the camera. Notice something different? The '70 looks enormous compared to the '71. Granted, the nose still appears shorter... and it is... but it's also tapered, with that taper showing away from the camera, so it looks even smaller. I'm still looking for the elusive picture of a '71-'73 next to a '69-'70 Shelby for further evidence of how much bulk the blocked-off nose adds. But just for fun, let's see how much the Mustang has grown over time by comparing the "biggest Mustang ever produced" (allegedly, the '71-'73) to the next-to-last generation - I think you'll be surprised by what you see. I'm not claiming to be an expert, by any means... but, to me it looks like the newer Mustangs have bulked up quite a bit from the "biggest Mustang ever produced" era of 1971 to 1973. I think the biggest reason people can't believe how much more bloated the newer Mustangs are than the '71-'73s is because they never see them together, and with the tiny 15" wheels on the '71-'73s, compared to the 18-20s typically found on the newer Mustangs, the "wheel-to-body" proportions cause people the think that they're smaller than they actually are. So, jump into the fray and post up some pics of some side-by-side comparisons you might have. C'mon, the 71-73 Mustangs are massive. Wheelbase is not much bigger. But they still look much longer, wider, and taller. I think that extremely flat slope on the back window helps make them look bigger than they actually are. Looks like the Mustang is not much smaller than the Fairlane. Perfect example of an optical illusion based on the above specs. (11-25-2018, 08:08 AM)1969_Mach1 Wrote: C'mon, the 71-73 Mustangs are massive. Wheelbase is not much bigger. But they still look much longer, wider, and taller. I think that extremely flat slope on the back window helps make them look bigger than they actually are. Hahaha! You a funny man! LOL!! Yes, they are a little bigger than the previous models, but I hope sharing what I've learned over the years that it's not as bad as the media made it out to be, even way back then. I just hate that even the modern times automotive journalists have continued the trend of making them sound like they're basically fastback LTDs. No doubt the 'flatback' look isn't exactly "slimming." I wouldn't call them fastback LTD's. I will admit, since being a member here, I've realized the 71-73 Mustangs have a bigger following than I ever thought they would. (11-25-2018, 06:53 PM)1969_Mach1 Wrote: I wouldn't call them fastback LTD's. I will admit, since being a member here, I've realized the 71-73 Mustangs have a bigger following than I ever thought they would. The next biggest indicator [to me] is that the repop manufacturers have been ramping up and expanding their products lines and availability. When I started in on mine, there was very little available in the way of replacement sheet metal, and I wound up harvesting many of the things I needed to replace from a couple of cars I found in a local 'yard, along with substituting a few items (rear shock cross-member from a '69-'70, for instance) - shortly after I'd finish a task, the new parts oddly became available (replacement upper and lower cowl pieces, etc.). Here is a picture of an old friend's car. This is the car he had when we were in high school. Lot's of memories. I am not sure but I think it is a 72. Correct me if I am wrong. It's a '73, actually. The biggest tell-tales are the vertically aligned signals in the corral of the grille ('71-'72s had horizontally aligned sport lamps in the grille with separate signals below the bumper in the lower valance), and the giant front bumpers (new federal laws for 3 mph bumpers). Thanks for clarifying this and the additional information. It is remarkable that he still owns the car after all these years. I was so young at the time I didn't remember what year the car was. Also, when we hung out together I was not quite convinced on Ford cars yet. My parents where Chevy fans and they bought me my first car a 1970 Monte Carlo, factory 4 speed and posi rear end. I wish I had the wherewithal to keep it but my mother said I sold the car before I left to the Navy. However, my son has the 1969 Camaro Pace Car (Z11) which has been in our family since the 1970's (2nd owner car). He is just getting ready to paint the car. Mechanically, runs and stops.